iPods have been around long enough that many of us take them for granted. Yes, they’re small. Yes, they hold a lot of music. And yes, they’re cool. That’s pretty much the baseline for any iPod. It takes something special to break through our now-jaded iPod sensibilities. The iPod nano, with its tiny size, sleek look, colorful display, and responsive controls is that special something. The nano is, in many ways, a hybrid of the iPod shuffle, the now-discontinued iPod mini, and today’s full-sized color iPods. Like the iPod shuffle, the nano uses flash memory (available in 2GB and 4GB configurations, priced at $199 and $249 respectively) rather than a hard drive. The higher-capacity nano holds the same 1,000 tracks as the original iPod mini. And like the mini, the nano dispenses with such higher-end capabilities as audio recording, downloading pictures from a camera attachment, and projecting slideshows to an attached television or projector. Unlike with full-sized iPods, you can’t install Mac OS X on the nano and boot from it—the Mac OS Installer recognizes the nano but refuses to install to it. (The iPod mini shared this same limitation.) Yet, like a full-sized iPod, the nano includes a crisp color display and lets you view album art as well as pictures downloaded from a computer. And just to show that it’s not a complete “me too” iPod, it sports new Stopwatch, Screen Lock, and Clock features. It’s also the first iPod that includes an unplayed podcasts indicator (a small blue dot that appears next to podcasts you haven’t yet listened to) and a Lyrics screen where you can view any lyrics added to a track within iTunes’ song information window. And, as you might expect, it sounds as good as any other iPod you’ve owned. At 0.27 inches from back to front, the nano is about as deep as six stacked credit cards. Bearing dimensions of 3.5 by 1.6 inches, you can hide it beneath a business card (it will, in fact, fit neatly inside a business card wallet). Yet, even with its small size and scant weight of 1.5 ounces, the nano doesn’t feel flimsy or delicate. The stainless steel back and polymer front don’t flex. And while a person whose glove size runs to Large could play a convincing game of “Which hand?” with a nano, the iPod isn’t so small that it’s difficult to use its click wheel or view text or pictures on its 1.5 inch display. The nano’s thin size has forced Apple to rearrange its ports. While the Hold switch remains on top of the player, the Headphone port is now on the bottom, next to the standard 30-pin Dock connector port. The position of these ports is a problem only when using audio devices with fat connectors. For example, my fat 1/4-inch stereo-plug-to-miniplug adapter wouldn’t fit on the nano when the Dock connector was also attached. 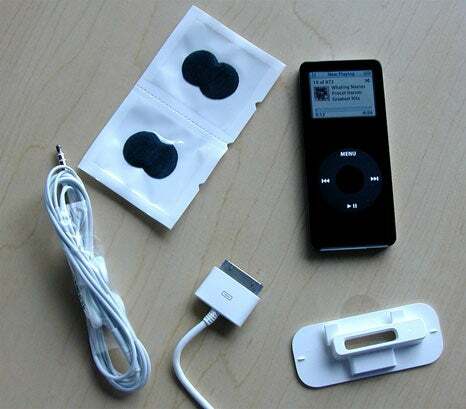 While longtime iPod users may be initially thrown by plugging headphones into the bottom of the nano rather than the top, it’s actually an advantage if you carry the iPod in your pocket. When you lift it out of that pocket it’s oriented so you don’t need to flip it around to adjust its controls. Speaking of the Dock connector, this iPod syncs only over a USB connection (though it can be charged via either a FireWire or USB connection). Apple suggests that this must be a USB 2.0 port, but I was able to sync the nano (albeit, very slowly) when it was plugged into my Power Mac G4’s USB 1.1 port. There’s no question that the lack of FireWire sync is going to be a problem for those with older computers that don’t have such a port. If you fall into this category, either look for a way to add a USB 2.0 port (via a PCI card or PC Card) or consider getting the larger iPod, which syncs with both USB 2.0 and FireWire. Given the lack of support for FireWire syncing, it’s not surprising that Apple includes only a USB cable in the box (along with the usual Apple earbuds and foam covers, software disc, and documentation). Fortunately, unlike the mini or full-sized iPod, the nano doesn’t ask you to plug it into a power supply (such as Apple’s optional $29 iPod Power Adapter or a FireWire port) when you restore it with the iPod Updater. Given its small size, the nano’s click wheel is responsive in normal use. You feel (and hear, in a quiet environment) a definite click when you press the wheel and the center Select button. As with other iPods, the nano scrolls smoothly as you twirl your thumb around the wheel. Like the iPod mini, this iPod can be a little finicky about accepting commands when you press the Select button and the click wheel at the same time (as you must when you reset the iPod by pressing Select and Menu). In my tests it sometimes took three or four tries to force the nano to reset. Owners of other iPods may initially be thrown off by the responsiveness of the controls. At least one person who tried my nano thought it scrolled a little too quickly, making it difficult to exactly select the item he was after. When I first used the nano I had a similar experience but quickly adjusted to the feel of the iPod and my scrolling became more accurate over time. While some may complain about the speed of the controls, no one will be upset by how quickly the iPod nano moves from screen to screen. This is particularly noticeable when you’re viewing pictures. When looking at pictures on my 60GB iPod photo there’s a noticeable delay between the time I select a thumbnail image and finally see the “large” view of that image. The larger iPod must spin up the hard drive before it can display the image. Because the nano is flash memory-based, there’s no hard drive delay and images pop to the fore in no time. Similarly, tracks begin playing in short order. The nano is also quicker to sync than other iPods. I synced the same 903-track playlist on a 4GB nano and a 4GB iPod mini. It took 9 minutes and 15 seconds to sync the nano. The mini took nearly 7 minutes longer to sync, finally finishing the job in 16 minutes and 13 seconds. Regrettably, battery life isn’t nearly as good with the nano as it is with the 2G iPod mini. In tests where I’d fully charged a 6GB mini, selected the first song in the mini’s Songs screen, and pressed Play, the mini was able to squeeze out over 26 hours of play time even though Apple rated the mini’s battery charge at 18 hours. Apple suggests that the nano can play uninterrupted for up to 14 hours. My first audio play test fell short by just over an hour, with the nano giving up the ghost after 12 hours and 52 minutes. A subsequent audio test hit the 14 hour mark almost exactly. The nano’s battery performed a little better than advertised with slideshows. Apple claims the nano can show slideshows for up to 4 hours. In my test of a looping slideshow of 1,786 photos, the battery lasted for 4 hours and 36 minutes. The blue-white LED backlight display is worth closer examination. Although it’s smaller by .17 inches (measured diagonally) than the display on the now-defunct iPod mini, it has greater resolution—offering a resolution of 176 x 132 pixels versus the mini’s 138 x 110 resolution. It also has a slightly smaller dot pitch—the measurement between pixels (a smaller value is better)—than today’s color iPod, providing a dot pitch of .168 mm versus the larger iPod’s dot pitch of .18 mm. These numbers translate into a sharp display, when lit, and one, unlike the mini, that includes Title, Artist, and Album information on the Now Playing screen (the mini offers Title and Artist information only). Regrettably, when the screen isn’t lit, it’s not easy to see what’s on it unless it’s under a direct light (either an indoor lamp or daylight). Apple makes some accommodations for the smaller display. To begin with, a photo album’s screen, where you view thumbnails of your images, offers a 4 x 3 grid of thumbnails versus the 5 x 5 grid you find on the larger color iPods. This is a wise choice as a smaller grid would make it all but impossible to discern one image from another. Although similar images were difficult to tell apart (multiple portraits of the same subject, for example), I could clearly pick out discrete images. And because the screen is so small, text can get cut off. 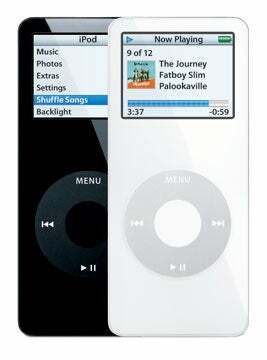 Thankfully, the iPod nano takes a hint from the color iPod and, unlike the mini, scrolls selected text in a ticker-tape fashion in a music menu (Artists, Albums, Songs, and Podcasts screens, for example) as well as scrolls track titles in the Now Playing screen. The nano includes a few extras not found on other iPods, specifically the Stopwatch, Screen Lock, and a new clock that allows you to create multiple analog/digital clocks in the nano’s Clock screen. I’ve covered the functionality of these features in my first look at the nano so I won’t repeat myself. I will say, however, that the Stopwatch seems a perfect addition to this iPod given its no-skipping-while-exercising nature. And although the Screen Lock feature isn’t bulletproof—a bad ‘un could extract the nano’s music and data by plugging it into his or her computer—it does lock out the functionality of the nano when it’s unattached to a computer. The multiple clock feature, however, feels a little gimmicky. I’m particularly pleased that the nano adds a Lyrics screen to the iPod’s Now Playing area. In this screen you can view any lyrics that you’ve added to the Lyrics tab of a Song Information window within iTunes 5. Currently the only way to add those lyrics is by hand—songs sold by the iTunes Music Store don’t (yet) have embedded lyrics. If you’re looking strictly for the greatest bang for your megabyte buck, this is not the iPod for you. A megabyte of storage on the 2GB model runs a fraction under $.10 and a little over $.06 for the 4GB nano. (Cost per megabyte is even higher for the iPod shuffle—measuring over $.19 for the 512MB shuffle and almost $.13 for the 1GB model.) Compare this with about two cents per megabyte on a $299 20GB iPod, and you’ll see that people who want the most for their money may pass on the nano’s cool form and handy size in favor of the higher-capacity iPod. Because there just isn’t a cooler iPod on the planet.